Star Wars: Galaxy’s Edge opens in approximentally one year. Disney’s Hollywood Studios has been under construction leading up to this moment for years. Just days ago, the park received a brand new parking entrance, and soon the Disney Skyliner Gondola transportation system will also be operational. 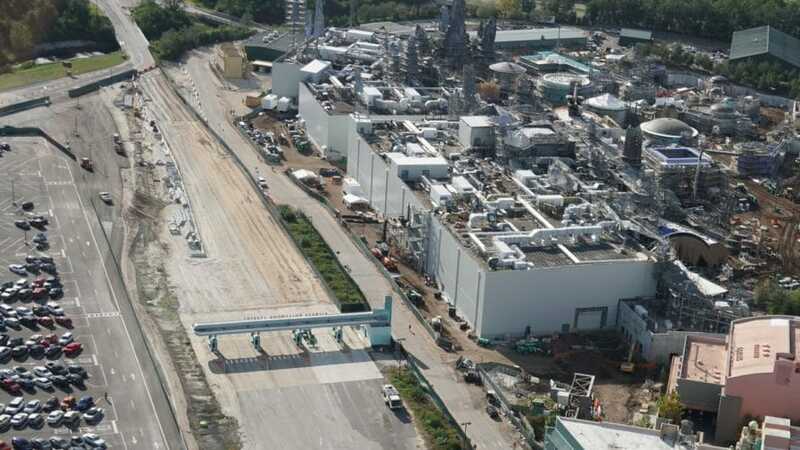 This is all in preparation for the the largest land expansion in Disney Park history. This photo report, with shots provided by @bioreconstruct on Twitter and @TharinWhitePhotography on Instagram, takes a look at the newest areas of theming. Starting off, we take a look at many of the new theming elements inside the land. Theming that extends to the ground is good news for us. That means that major construction in that area, which involves cranes and large trucks, is mostly finished. Disney wouldn’t risk doing major painting or theming elements if there is a chance a big truck could accidentally back up into it. 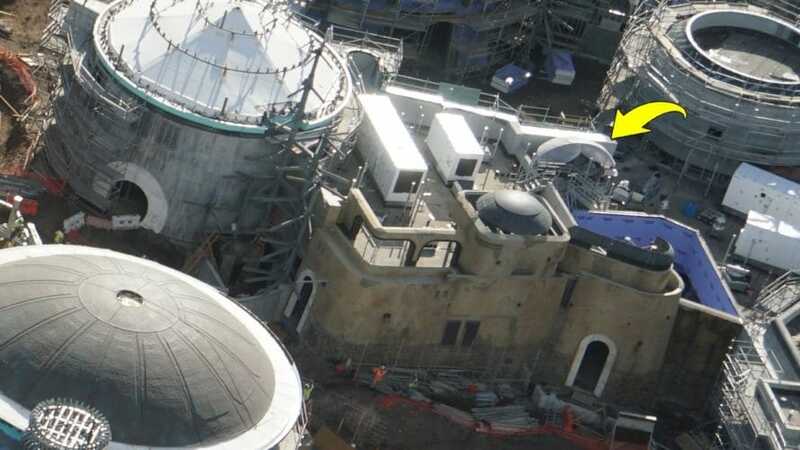 Here is another great angle of the new construction elements that have been added to this section of Star Wars: Galaxy’s Edge. We know that the town in this land will be called the Black Spire Outpost. 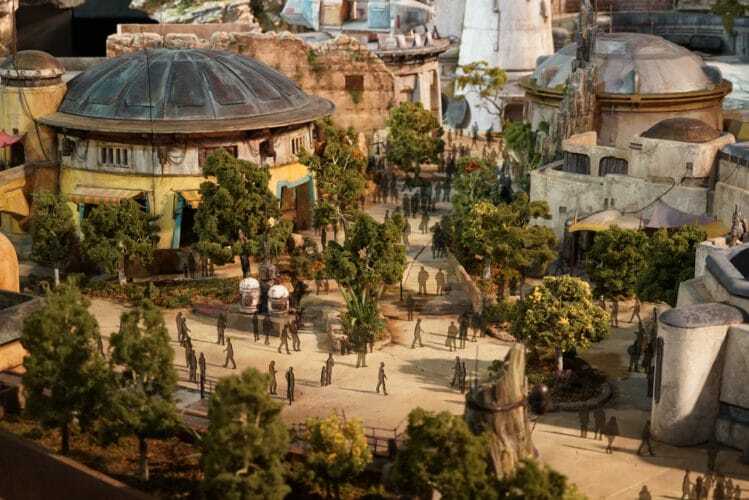 We also know, thanks to the model (pictured below), that the large domed building in the center left will house a pod racer engine. 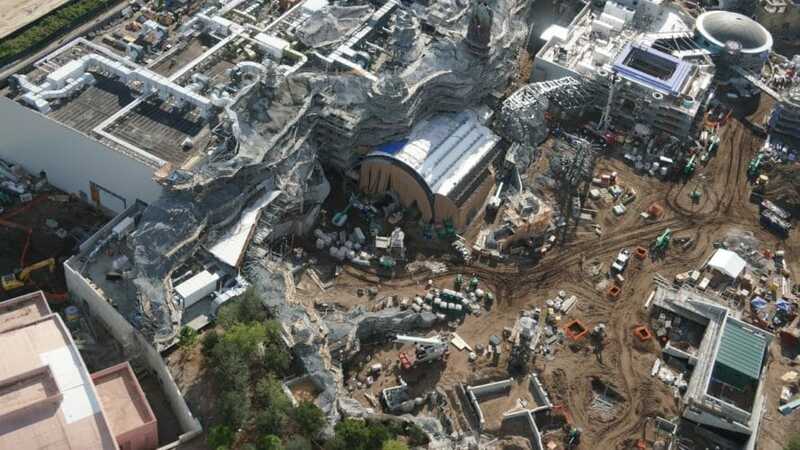 It is great to see the land beginning to appear much more like the model that was displayed at the D23 Expo. We are still many months away from the first sign of themed foliage inside the land, but that will be another milestone we will keep out eyes out for. Here is another section of theming that is being prepped. This appears to be another dome, much like the gray one right in front of it. Domed roofs certainly seem to be the theme at the Black Spire Outpost. This dome’s theming is practically finished as scaffolding has been taken down. This specific tower is located next to where the Millennium Falcon will be parked. 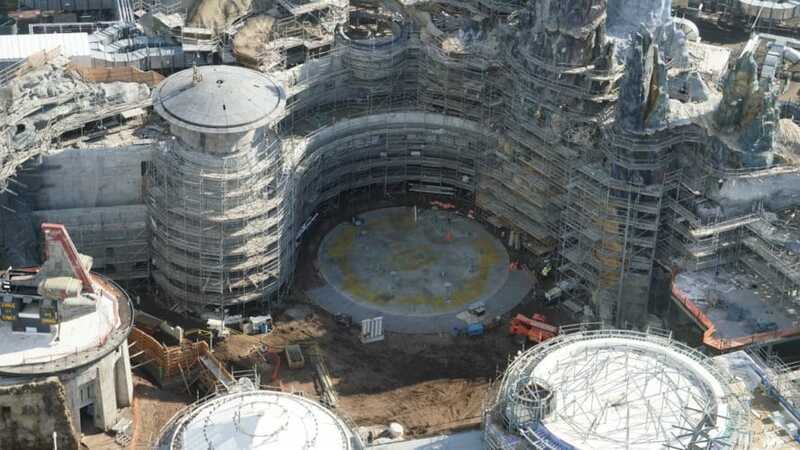 Over at Disneyland, the Millennium Falcon has already begun to take shape. 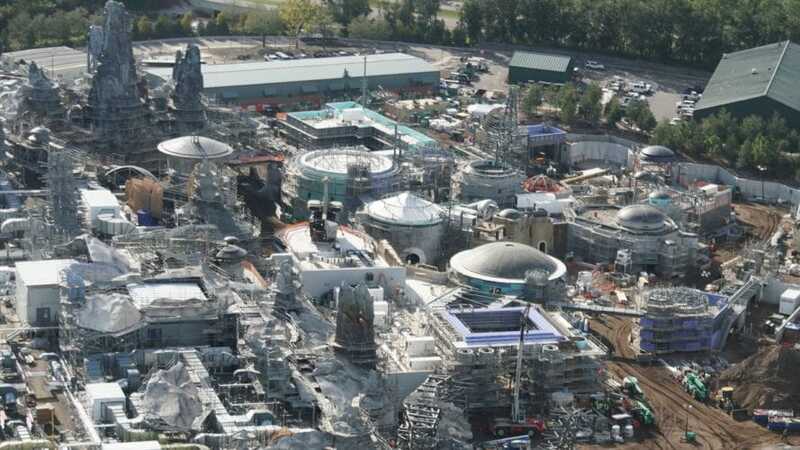 This overview showcases most of the skyline of Galaxy’s Edge. The rocky backdrop of petrified trees, the reason the outpost is called Black Spire, dominates the left side of this photo. The petrified trees are mainly placed on top of the show buildings for the First Order Star Destroyer and Millennium Falcon attractions. Looking behind the show buildings for the two attractions, we can see one of the former entrances to Disney’s Hollywood Studios. It appears that deconstruction has already begun, just days after it was closed down. This may be a sign that this area needs to be used quickly, possibly even before the opening of Star Wars: Galaxy’s Edge. The new cast member entrance is nearby and we can see cars already using the new parking lot expansion nearby. Perhaps this entire area will simply be another section of parking expansion to be used by cast members. This second angle of the construction helps to further showcase the parking expansion. While it would not be ideal to park guests so close to a show building, the extra room behind the land would certainly be a great spot to allow cast members to park. 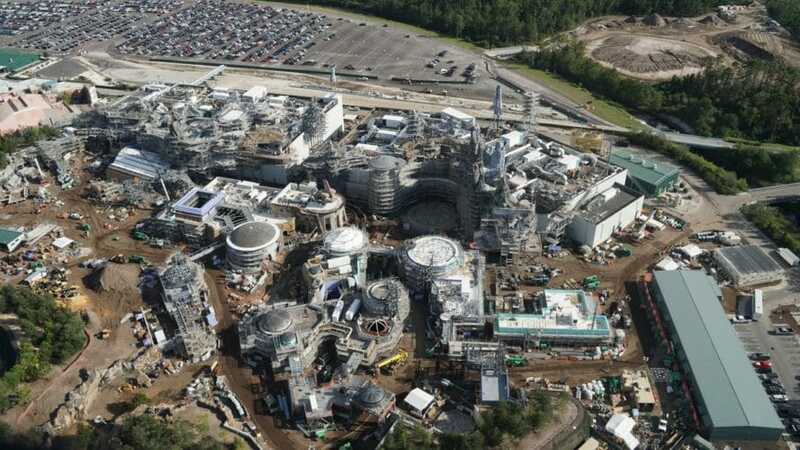 They will certainly need this extra parking when Galaxy’s Edge opens. It is not a wild guess to assume that hundreds of new cast members will be needed to run the land. 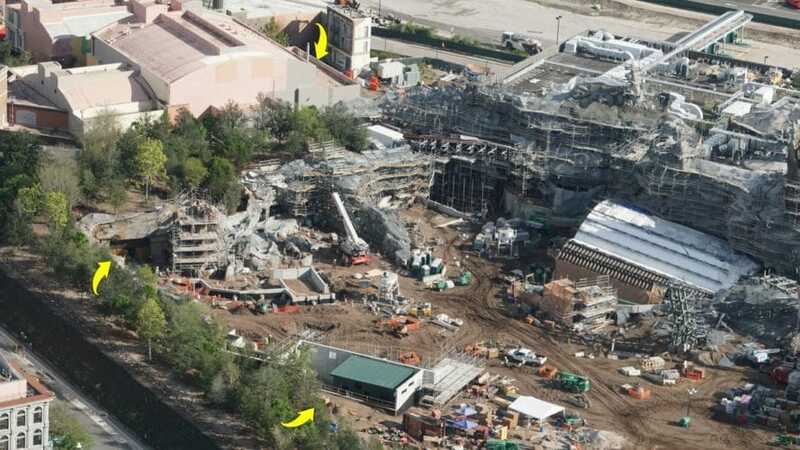 The large dirt pile at the top right is the future location of the Star Wars themed hotel. This shot showcases three notable items to look at. First, at the top, we can see part of the Muppets show building has been painted gray. 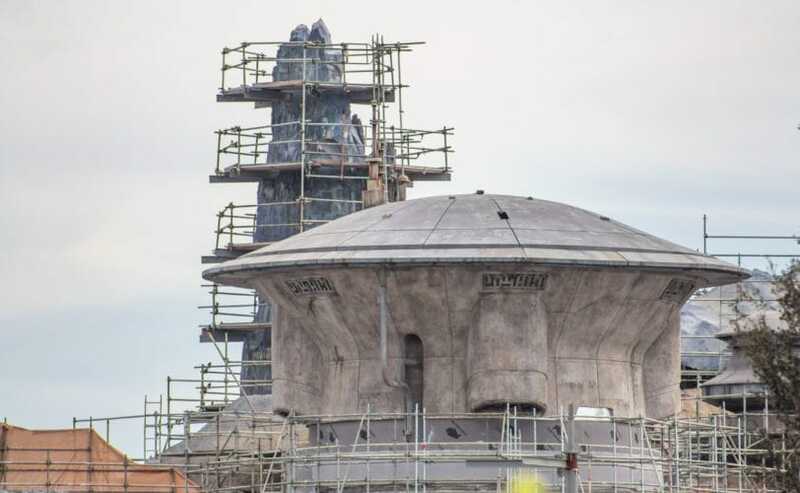 Perhaps only this section will be visible from inside Star Wars: Galaxy’s Edge and the gray paint was added to blend in with the mountainous landscape. Secondly, on the left, we can see one of the two entrances into the land. This entrance will take guests from the Grand Avenue section of Disney’s Hollywood Studios into Star Wars: Galaxy’s Edge. While there will also be a second entrance from Toy Story Land, I believe this entrance is primarily meant to be the main entrance. Lastly, in the bottom center of the photo, is a recently-added green roofed building. This area, presumed to be the entrance area for the First Order Star Destroyer Attraction, has recently added scrims. Mostly likely this is being done to work on painting and fine details that need to dry before they can be fully exposed to the outdoor conditions. 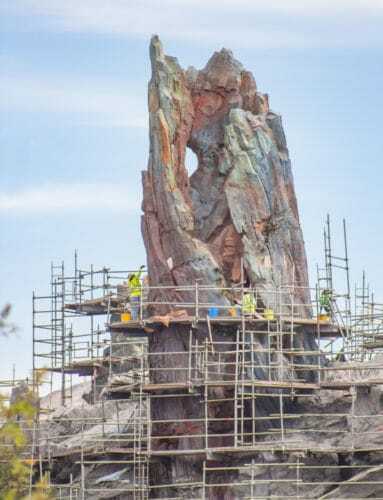 Atop of the area covered in scrims is where more petrified trees and rock work are being added, including one of the largest petrified trees of the land. This tree will certainly be one of the main way pointing structures in the land. It is one of the tallest sections in the area, and its uniqueness alone makes it an easy target. Here we get a great glimpse of a starship parking spot, all prepared for the arrival of the Millennium Falcon. This alcove will house a full 1:1 scale replica of the infamous ship. Guests will be able to do a complete walking tour of the Falcon. 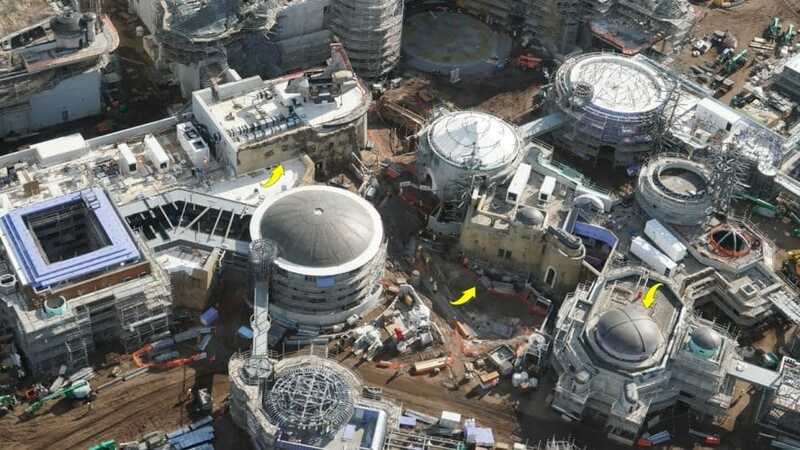 It is also presumed that this area will be the entrance for the Millennium Falcon attraction. This area of the land has been showcased in numerous bits of concept art and video, including the ending of one of the randomized Star Tours adventures on the nearby attraction in the Hollywood Studios park. 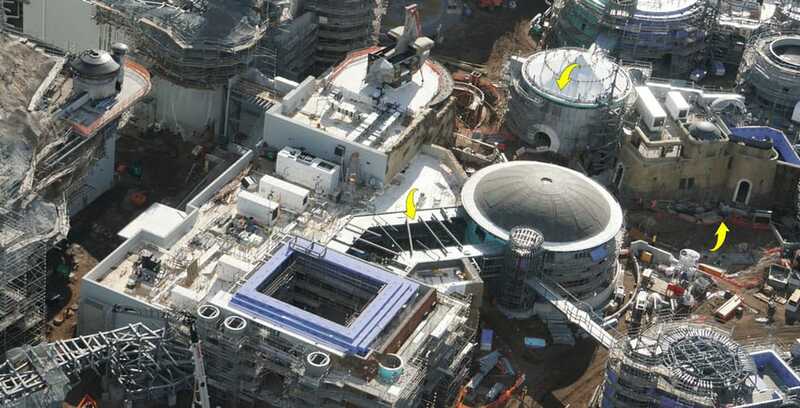 Above where the Millennium Falcon will be parked is the highest peak of Star Wars: Galaxy’s Edge. These tall dark peaks of petrified tree are the reason for the name, Black Spire Outpost. An enormous amount of work has already been completed at the construction site, but much more is on the way. Make sure to follow along as we continue to bring coverage of this incredible upcoming land. 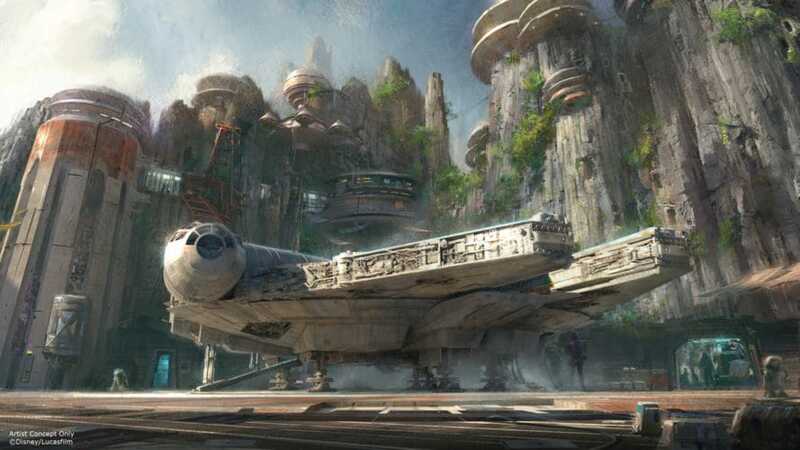 Star Wars: Galaxy’s Edge will open Summer, 2019 in Disneyland California, and Late Fall, 2019 in Disney’s Hollywood Studios at Walt Disney World. Click one of the many links below to see how the progress has continued throughout the past year in both Disneyland and Walt Disney World.